A mold for growing high-purity crystalline silicon in a specific size. The mold material is molybdenum. Most of the mold’s length is immersed in a temperature-controlled environment. One end of the mold, at a high temperature, is placed in a controlled atmosphere consisting of an inert gas, such as nitrogen. Molten silicon is poured from a crucible into this open end of the mold in the controlled atmosphere. The extrusion mold is positioned at an incline so the molten silicon will flow through the mold until it contacts a seed crystal of silicon. This seed crystal is located where the silicon solidifies. The molten silicon begins to crystallize into a structure oriented according to the seed crystal. As crystallization occurs, the seed is slowly withdrawn via the opposite end of the extrusion mold which is open to the atmosphere. The crystalline silicon structure comes with the seed. 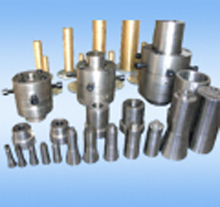 We also can provide other types of molds, such as solid forging die molds, pressure die casting molds, etc.